Guild Players | Murder! Mystery! And Suspenders? Sir Timothy De'Ath has been found murdered in the library of his home. There is a mystery to be solved but everyone is acting suspiciously. ...plus a suspender belt. Just like their alibis, it could lose its elasticity at any minute. 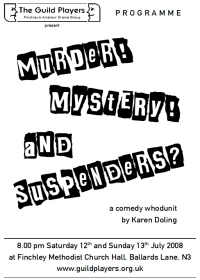 Welcome to the Guild Players fourth and final production of the 2007/08 season - Karen Doling's "Murder! Mystery! and Suspenders?" We hope you will find this light and amusing piece just the thing for a summer evening. Building on the success of our regular Holy Week touring productions, tonight we are using our recently acquired portable staging to change the layout of the hall. We hope this experimental setup will provide both a different viewpoint for the audience and a new challenge for the actors. The first show of our 2008/09 season will be the pantomime "Aladdin". Performances will be on 10th to 13th December.